Enter Frederick Law Olmsted, the landscape architect who’d made his name designing Central Park in New York City and leading the effort to conserve the Yosemite Valley in California. 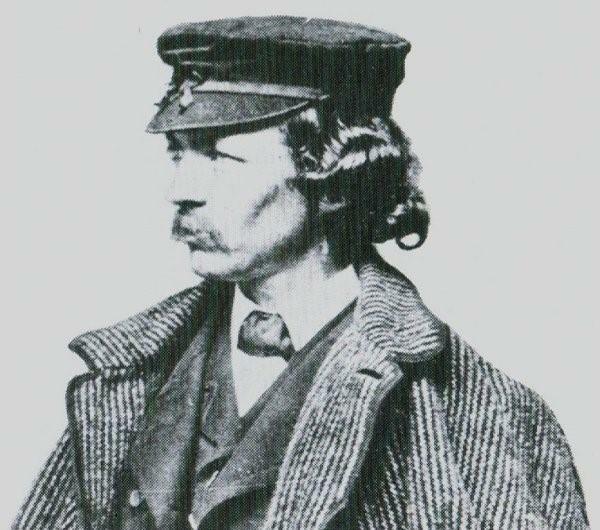 In August 1869 Olmsted was working on the Buffalo parks and parkway system, when he took time out to visit Niagara Falls. He rented a room at the famous hotel by the American Falls, the sprawling Cataract House. There he was joined by William Dorsheimer, the district attorney for northern New York and the man who headed the Buffalo parkways commission. Also at the hotel was the young, not-yet-famous architect Henry Hobson Richardson, who was designing Dorsheimer’s mansion on Delaware Avenue. Olmsted c. 1860. He rambled Goat Island with Richardson and Dorsheimer in 1869. On August 8, the three friends took a stroll on Goat Island, pretty much the last piece of unspoiled land at the Falls. Like others before them, they were appalled at how much this marvel of nature had been obscured from view. The next day they convened a meeting in Dorsheimer’s hotel room, where they were joined by other prominent men who shared their vision of a Niagara free of obstruction, where visitors could gaze upon the rushing waters and ramble through wooded pathways to their hearts’ content. Thus began a long campaign, called the Free Niagara movement, that brought to bear the influence of some of the continent’s most famous and influential figures. Olmsted and his business partner Calvert Vaux were joined by the likes of the novelist Henry James; the Governor General of Canada, Lord Dufferin; William Morris, founder of the arts and crafts movement; the intellectuals Ralph Waldo Emerson, Henry Wadsworth Longfellow, Thomas Carlyle, John Ruskin and Charles Darwin; and the renowned landscape painter Frederic Edwin Church, whose vast 1857 panorama of the Falls drew crowds on international tours and first brought widespread attention to Niagara’s precarious condition. Frederic E. Church’s “Niagara” (1857) drew 100,000 paying visitors in the first two weeks of its debut in New York City. Crowds marveled wherever it toured, increasing the demand for an unspoiled Niagara Falls. For more than a dozen years the Free Niagara conservationists lobbied the governments of New York State and Ontario. Finally in 1883 came the breakthrough, when Dorsheimer’s Buffalo friend Grover Cleveland became governor of New York. Cleveland signed a bill calling for the establishment of a state park at Niagara. Two years later, the Niagara Reservation became reality, the first state park anywhere in the United States. And in 1888, it was joined on the Ontario side by Queen Victoria Park. 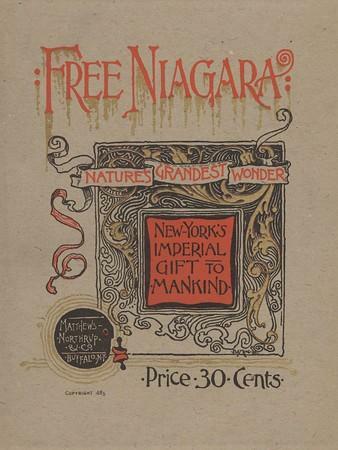 Free Niagara, an 1885 tourist booklet commemorating the opening of the Niagara Reservation state park. On the U.S. side, the park commissioners started clearing out the structures that blocked the views along the upper rapids, limiting the factories to areas downstream from the Falls. 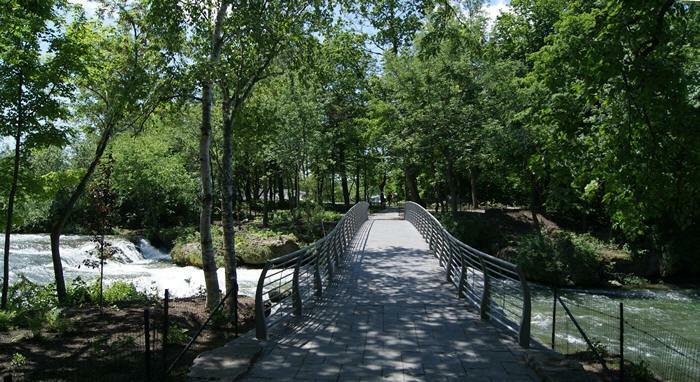 Soon Olmsted and Vaux began the landscaping that gives the American side its character today — ambling walkways and idyllic glades where visitors can contemplate the beauty of nature. Likewise on the Canadian side, structures and mills were cleared to make way for Queen Victoria Park, which followed a more formal English garden design. Both are surpassingly beautiful. But it all could have turned out quite differently at Niagara, had it not been for that Goat Island stroll Frederick Law Olmsted and his two friends took back in August 1869. To see the WNED documentary “Frederick Law Olmsted: Designing Western New York,” click here.